Tony and Ange offer a very warm St.Helens welcome to everyone on holiday in Cala Millor. 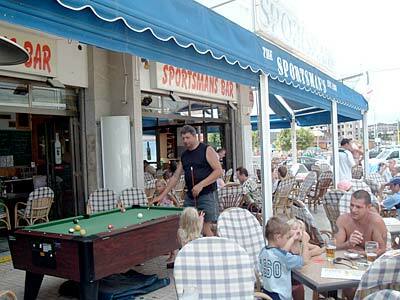 We are renowned not only for good food, served all day, but also for being one of (if not ) THE friendliest bars in town. Our nightly entertainment in the summer gives you a chance to sing on Karaoke, join in our quiz nights, have a flutter on race night and watch local artists enetrtain you while you enjoy a pint ... or five! If you have a big appetite we cater for you ... try our belly buster breakfast - if you dare. If you have a small appetite then we have "Small bits for old gits". Kids have their own menu too. With our network of TV channels we can show all major sporting action including the mighty 'Saints' conquering all in Super League ... oops, that's us just lost all the Bradford, Wigan and Leeds holidaymakers!!! Every night is different to the next at the Sanddancers Bar in Cala Bona, because of the mix of people, Young, not so Young, Couples, Singles and Families. With great music from the 60's up to date, Quizzes, Karaoke, Great Entertainment, you can see why we're the busiest, best night in town! and the bonus is: We have an enclosed Play Area, Kids Cinema and PlayStations, all FREE, together with our FREE "Calpol Lollies" which means you can relax coz the kids are sorted!